Just about every day I experience something that I need to share as I tend my garden, run my business, visit places in my hometown and beyond. Often, this includes a photograph or perhaps a sketch of a wildflower in bloom in my yard, a bird I see along the trail, snow falling on Main Street, the view from a bus window as I cross the river into town…sometimes it even includes an essay or poem. I’ve never been good at keeping a journal unless you count the piles of papers stashed here and there through the years, but in any case it’s a pleasure to share those little moments of my world. I purchased my first Pentax K1000 in 1983 and began photographing in black and white. I’ve been hooked ever since carrying that poor thing with me everywhere, purchasing new lenses and gadgets now and then. I never really had the time to sit down and study photography, but those years of slow, diligent experimentation and studying the results were the best way for me to learn how to take a picture. I had been photographing mostly for images to paint later in my studio, but I’m also a graphic designer and once the world started publishing everything in living color sometime in the mid-90s, I realized I had images that in some categories were as good as the ones I was purchasing at a pretty steep price. I have years worth of negatives to scan, and I’ve still got that Pentax K1000, but now I’ve moved to digital and displaying photos is so streamlined. Ihope you’ve enjoyed browsing, and stop back soon to see the newest photos. I endeavor to do at least a small sketch each day, so I carry a small pouch of art materials and a several wirebound sketchbooks with me. I usually frame these little originals, and once in a while I use them in design as illustrations and I also designed a series of notecards, notepaper and notepads using the monochrome sketches. 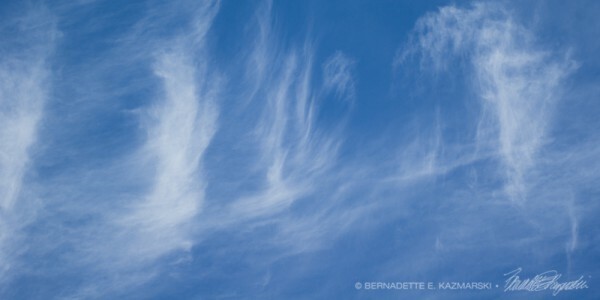 To see more of my work, visit my website at www.bernadette-k.com. Thanks for visiting! And I really enjoyed my virtual visit to Argentina–such a spare and lovely place! But the 729 hands are so moving I just can’t describe; they could have sketched an outline of a person or several people but instead it looks as if they are waving to us from time! I can’t wait to see more. Hi, yes, Cueva de las Manos (the caves with painted hands) is an overwhelming place. I am very lucky to have had the possibility to visit that remote spot in my country. Thanks for reading! You are my first reader here, so today is a good day for me, hehe!. I´ll be posting more about my country, especially from my trips to some other incredible places here. Just discovered your site. Looking forward to seeing the world the way you see it. Welcome! thanks for your compliments. I’m so glad to be able to share these paintings and photos here.